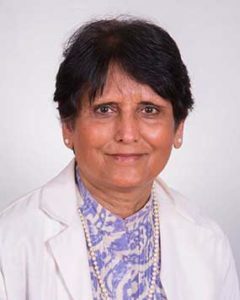 Dr. Meera Oza has been practicing Rheumatology since 1985 in Orange Park and serving greater Jacksonville area for more than 30 years. She completed her medical school in Lady Harding Medical College in India, and finished her internal medicine and Rheumatology training at Wayne State University in Detroit Michigan. She is a fellow of American College of Rheumatology and is board certified in Internal Medicine and Rheumatology. She is a past-president of the Florida Society of Rheumatology and has served as a board member since 2001. She has served on the Affiliated State Council and Insurance subcommittee of the American College of Rheumatology, and is presently serving in Medicare Carrier Advisory committee for First Coast Service Options. She is also a member of several professional societies. Dr. Oza has participated in several clinical trials of new therapies for rheumatological diseases for the last 25 years in order to gain first-hand experience of the efficacy of the new drugs before the FDA approves them for treatment.